Preheat the oven to 180°C/Fan 160°C/Gas Mark 4. Line 3 baking trays with non-stick baking paper. Measure the golden syrup and black treacle into a jug and add the egg. Beat well until thoroughly mixed, then set aside. Sift the flour, salt, bicarbonate of soda, cinnamon and ginger into a large mixing bowl. Stir in the sugar. Rub in the butter until the mixture looks like fine breadcrumbs. Add the egg mixture and stir to combine, then draw the mixture together and knead lightly until smooth. Wrap and chill for 15 mins. Roll out the dough on a lightly floured work surface to a thickness of 0.5cm. Cut out gingerbread men with cutters and arrange on the baking trays, allowing some room for spreading. Bake for 12-15 minutes until golden. Cool for 10 minutes on the trays, then transfer to cooling racks until completely cold. To decorate, roll out the icing thinly and use the gingerbread man cutter to cut out shapes, placing them onto the biscuits. Cut the mini marshmallows in half, and fix them in place with a little writing icing for the eyes. Use the black icing to mark out the ‘bandages’ and the red icing to highlight the eyes. 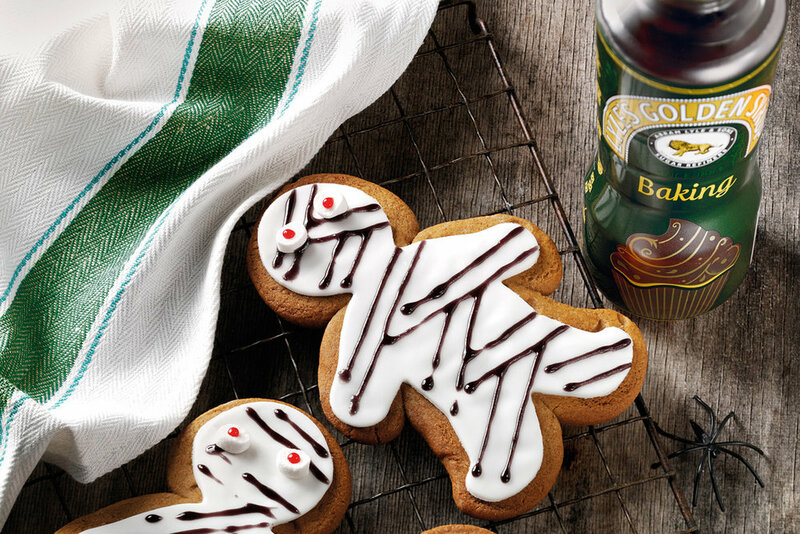 If you want some more Hallowe'en recipes, head over to Lyles Golden Syrup. For more baking recipes, grab the latest copy of Yours.